Linen fibers are not a short fluffy ball. Instead, they are the stems of a plant, the flax plant. For that reason, linen is a much longer fiber than cotton. For cotton, the staple length varies from 3/8 inch to 2 1/2 inches. With linen, the staple length varies from 2 to 36 inches. Because linen has such longer staples than cotton, it is easier to produce yarns and has been around for much longer than cotton – back into ancient times. It is difficult to produce consistent yarns with cotton’s relatively short staple length. It wasn’t until the Industrial Revolution in the late 1800’s that machines for processing cotton made it commonplace as a fabric. Linen’s long staple length makes it smooth, glossy and crisp. Garments made with linen stand out from the body, with more bounce and less drape than cotton. Linen wicks moisture, feels cooler, and dries much faster than cotton, again due to the long fibers. Linen can pull moisture, then feel dry to the touch – more so than any other fiber. This makes linen an excellent choice for summer wear and hot/humid weather. It also does not build up static electricity. Linen is a very durable fabric. It is lint-free, again due to the long-staple fibers and does not hold onto dirt. It is very washable, due to the fact it is a cellulose fiber. But be careful – certain weaves of linen are not washable! In these cases, the weave can distort if the fabric is washed. To test, cut a 6-inch square, trace around it on a piece of paper, then wash. Compare the tracing with the swatch after washing. Like cotton and other cellulose fibers, linen is stronger wet than dry. It also has little elasticity. Linen also has several weaknesses, some of which can be marketed as strengths. Linen does shrink when washed. You can also steam-press linen to shrink instead of pre-washing. Linen will lose its crispness when it is laundered, because water softens the fibers. 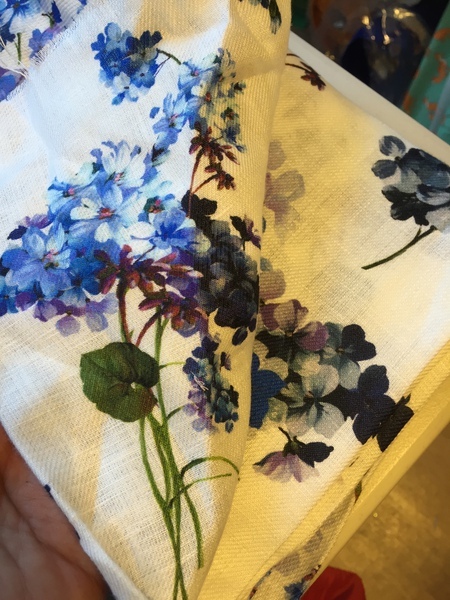 Over time, this will make linen softer and beautiful to touch. 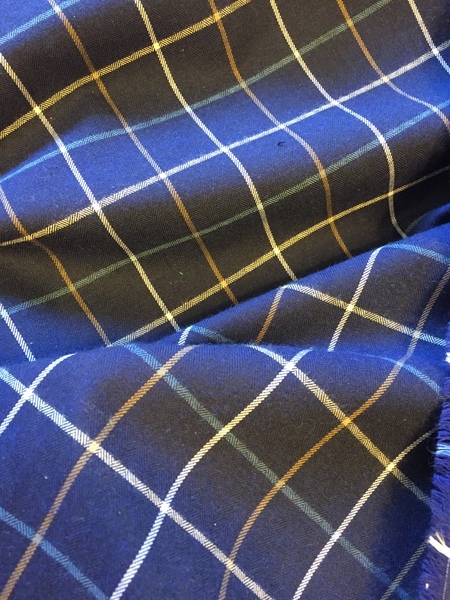 This is mainly a concern if you want to preserve the original crispness of the fabric in your project. Linen has a notorious reputation for wrinkling. It does wrinkle easily, due to its long staple fibers. But it does press very well. It is best to regard linen’s wrinkling as part of its charm, and embrace it. Be careful with pressing linen – if you press in a crease you don’t want by accident, it can be very hard to get out. To remove an accidental crease, get the fabric wet, then press it dry with the iron. Pressing linen can also develop shine marks. This occurs because the fibers are literally being smashed by the iron. Use press cloths, or press the fabric from the inside of the garment. Cotton allows for a snug fit in garments, linen does not. In snug or form-fitting garments, such as tight pants, distortion of the fabric is a problem. Seams will distort at the curves, compared to cotton. Cotton is also more forgiving, with regards to fit. Linen will show every fit issue. The very best linen feels cool to the touch, and smooth and firm under the fingers. Linen fibers have tiny slubs, but the best linens have a minimum. Cheaper linens use short-staple fibers, tend to be scratchy, and will break down and go fuzzy faster. Higher-quality linens use longer fibers, are smooth to touch, and are more durable. Linen knits do exist, but are hard to find. Compared to knit fabrics made with other fibers, they tend to sag/drop more, due to less natural elasticity in the fiber. (But according to the Britex staff, linen knits are quite lovely). As with cotton, always preshrink linen fabrics prior to sewing. Do not tumble-dry linen, because it makes the fabric take on a rough texture. Instead, hang it to dry, then press it with an iron. If the finished garment is intended to be laundered, then pre-wash in the machine with a delicate cycle, cold water, then press with an iron. If the finished garment is intended to be dry-cleaned, then steam-press to preshrink. Some sources say to mark linen with pins only. Wax and chalk markers can permanently stain the fabric. Test in advance! Press linen from the back side, or use a press cloth to prevent shine marks. Blends alter the characteristics of fabric. The best blends try to highlight the best qualities of both fibers into one fabric. The warp and weft fibers in the weave can be different yarns. Sometimes the polyester is inside the yarn, covered by cotton on the outside. Sometimes fibers are blended together to make the yarn. Advantages: Polyester adds a lot of durability to the fabric, and helps prevent wrinkling. Disadvantages: Polyester does not breathe – it is plastic. (Imagine wearing a plastic bag). Polyester also takes away from the softness of the fabric. As mentioned in Part 1, rayon is made from the cellulose remains of the cotton plant after the fluffy fibers are removed. It is not a true synthetic, since it comes from a plant origin rather than petroleum. Rayon is an extruded fiber, and unlike polyester and other true synthetics, it breathes nicely. It also drapes nicely. Rayon can be blended with both cotton and linen. Advantages: Rayon blends do not wrinkle as easily. Rayon also adds softness and drape. 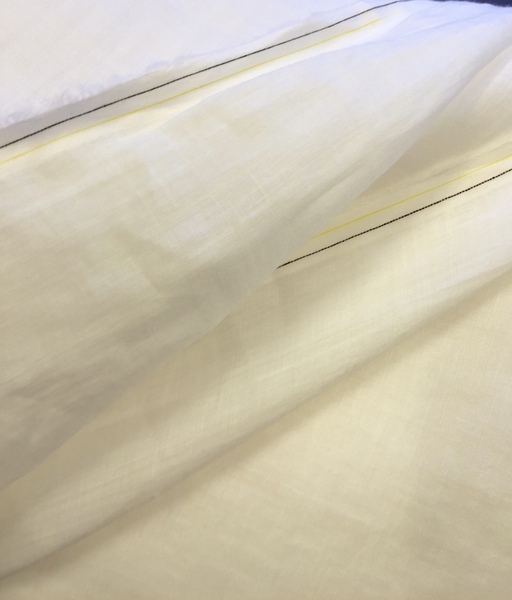 Silk can also be blended with both cotton and linen. Advantages: Adds luster and drape. Reduces wrinkling. Makes the fabric more luxurious. Disadvantages: Silk is an insulator. A silk blend will be less cool, and less breathable. It will feel warmer. Lycra is also blended with both cotton and linen. Advantages: Adds stretch and return. Adds comfort and movement. Wool is combined with cotton. Viyalla is the name of one cotton/wool blend that is 80% cotton, 20% wool. Advantages: Adds durability, softness, and loft. For primarily wool blends, cotton adds coolness. Home decor linen can be used for apparel. The main difference between home decor linen and apparel fabric are the finishings. Home decor and upholstery linens have finishings applied to make them fire-retardent and wrinkle-resistant. You have to get these finishings off in order to make them useful for apparel. Wash the fabric extensively before you attempt to use home decor and upholstery fabrics for a garment project. Additionally, upholstery fabric is meant to be dry-cleaned, not laundered. Dyes in the fabric may leak if the garment is washed. The best advice is to cut a swatch, wash it, and see what happens. Finally, linen sheets and duvet covers vary as to their suitability between home decor and apparel purposes. Some linen sheets incorporate “tow”. “Tow” are left over bits of the linen plant, all short-staple. They are collected and used for different purposes, such as being included into lower-grade linen. This may make them unsuitable for garment projects. 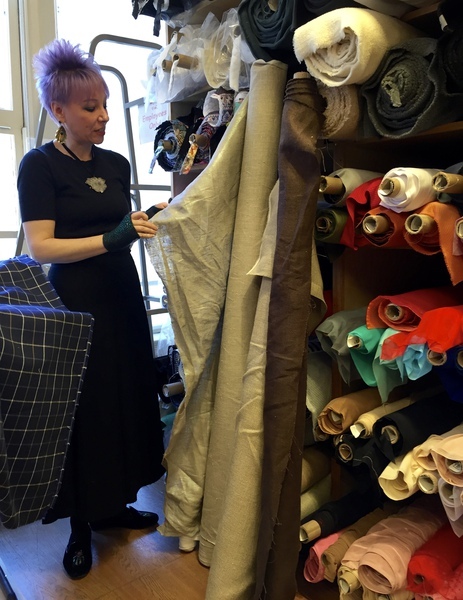 Again, thanks to Chuleenan Svetvilas from the Bay Area Sewists for sharing her photos for this article. All photos in this article are hers. Thanks to you I shall do better in the future. Very much appreciate the information!